Are you thinking of holding a sweepstakes to drum up business? Did you know that doing so could open you up to a great deal of legal liability? Contests and sweepstakes are great marketing tools for getting new customers, building brand loyalty, and generating revenue. However, because they can open you up to liability they also have a lot of rules you need to follow. 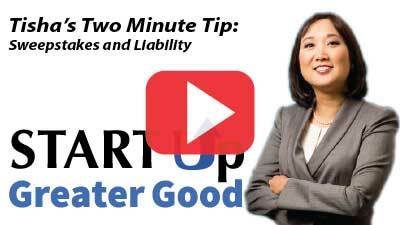 In this week’s two-minute tip Tisha discusses the potential exposure you could open yourself up to when you hold a sweepstakes and a way for you to minimize it.